Mano al Hermano students look for fish and other animals in the water at Jockey’s Ridge State Park on Friday. The North Carolina Coastal Federation’s northeast staff ended last week with a treat — spending the day with more than 50 students who participated in Mano al Hermano’s summer reading program. This is the federation’s second summer partnering with Mano al Hermano. The Albemarle-Pamlico National Estuary Partnership provides funding for the federation to purchase books related to the environment. Volunteers like Erica Connery, the Americorps member in the northeast, then read those books with students throughout the summer. Last year, staff and Mano al Hermano students spent the day at Jockey’s Ridge State Park, where the students were able to apply some of what they read to the coastal environment. Many of the 52 students at this year’s trip to Jockey’s Ridge State Park also attended last year and were eager to return. Connery said some of the kids were even already talking about next year’s trip. Connery spent the summer tutoring a family of three kids as well as a second-grade student she had been tutoring throughout the spring. “It was really fun to see the kids I tutor interacting with others and getting to show them firsthand all the cool things we talk about at their houses each week,” she said. Mano al Hermano is a community-based nonprofit organization that aims to empower Latino families through education and positive integration programs. Its summer literacy program involves Latino students from kindergarten through fifth grade. Each week during the summer, an adult volunteer visits a student’s home to read together and complete a follow-up activity. This year, the federation provided A Day in the Deep, Nature Recycles — How About You? and Henry the Impatient Heron. During the field trip, students got to experience what they read about and learned more about environmental stewardship. They caught and released sea creatures, learned about coastal ecosystems and found out more about where their trash and recycling goes. Ann Daisey, the federation’s community conservationist, led a station on trash and recycling at the field trip. “When they got to the step on where the trash truck takes the garbage, one boy said ‘the garbage grave yard.’ And I think that is a very good description of what happens to human’s trash,” Connery said. 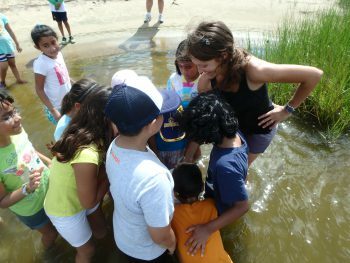 Connery said all of the staff enjoyed working with the students, and coastal education coordinator Sara Hallas said many of the kids were especially surprised at how many sea animals they were able to capture in their nets.